This week Darren Cross from Match Magazine joins Matt Cuttle in the studio to discuss Free Kick tips. 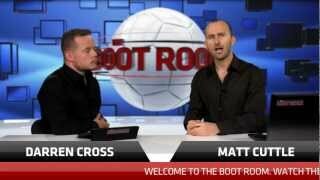 Learn all about Flick Shots, Curling and Smashing The Ball in this week’s episode of The Boot Room. If trying to curl the ball round the wall and into the goal, choose a player with high curve and free kick accuracy stats. Choose a player with good free kick accuracy and power. Aim your shot above the smallest player in the wall and at the side of the goal the keeper isn’t standing. Hold up on the left stick to get the ball over the wall and back down to hopefully score a goal or test the goalkeeper. You can bring in extra players using LT or RB. Fake a shot by holding shoot, then pressing the short pass button. You can then press the through pass button to kick the ball towards the runner and set them up for a shot closer to the goal. Press LT to bring in an extra player. Hold LT and tap long pass very quickly. The player will then flick up the ball for your original free kick taker to take a shot at goal with. Join Darren and Matt next week for tips on First Touch Control.